A giant full moon hung in the background of Viktor & Rolf’s fall 2012 collection shown at Paris Fashion Week. I was excited to see this collection as I intrigued by their pre-fall collection. But the runway collection seemed tacky in comparison, sheer lingerie like pieces and fur. 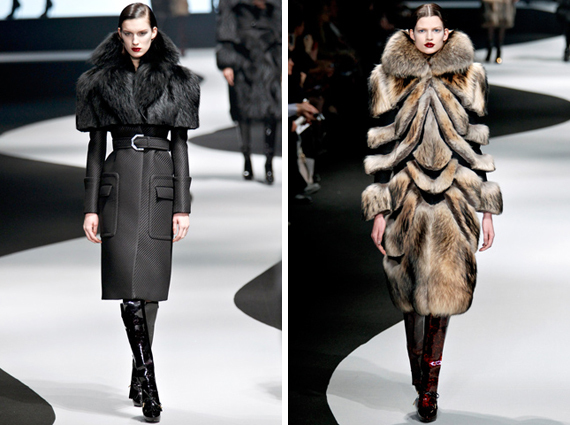 Though I am rather uninterested in real fur, the coats did catch my attention as they reminded me of Blade Runner’s Rachael. Pre-fall on the other hand was dark, romantic but modest, mysterious, and an appealing mix of American Gothic and Victorian.